This week’s selection from GP’s Classic Steel is one of the most interesting race bikes of the seventies, the 1979 HL500. The HL500 or “Aberg Yamaha” (as it is sometimes called) started out with the most pedestrian of roots. In 1975 Yamaha had introduced an all-new four-stroke trail bike to the American market called the XT500. The XT was no racer, weighing in at over 300 pounds and using a very mildly tuned 499cc four-stroke single, the bike had been designed as an on/off road enduro bike. Interestingly this overweight, American market play bike actually caught the eye of a couple of Swedish motocross legends. 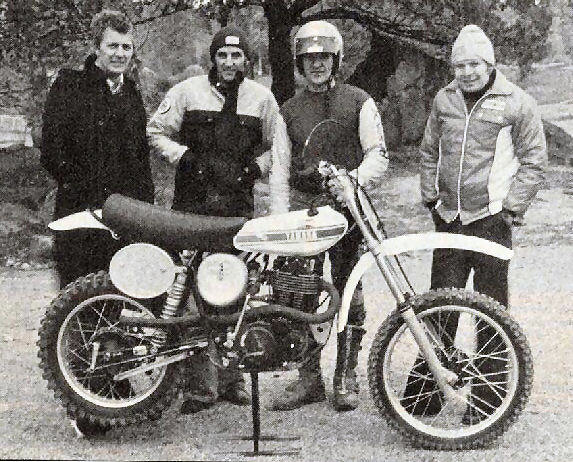 Torsten Hallman, Sten Lundin, Bengt Aberg and Steffan Eneqvist with the very first HL500 prototype. 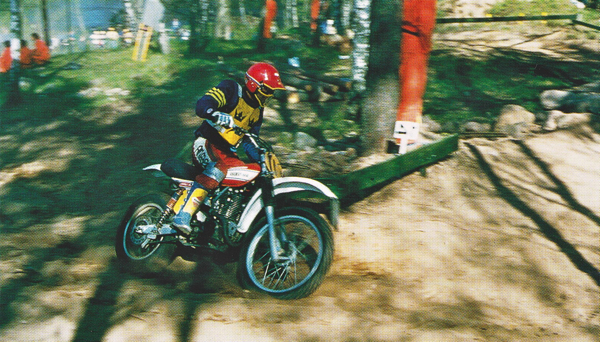 In 1975 four-time World Motocross champion Torsten Hallman and two-time World Motocross champion Sten Lundin were both working for Yamaha of Sweden. 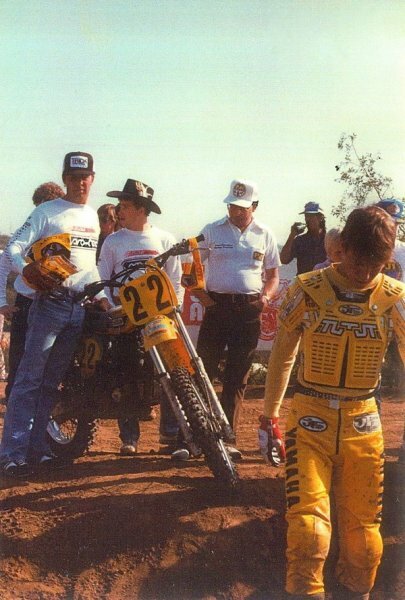 The two Swedish motocross legends became intrigued when they saw information on the big Yamaha single. 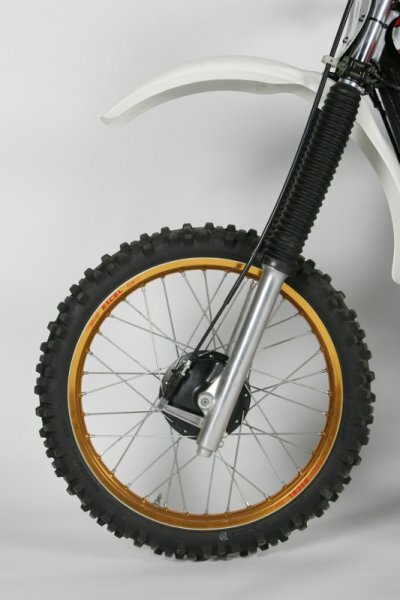 By 1975 the two-stroke had long since taken over as the dominant bike in motocross, but the two Swedes thought it might be interesting to try and make a racer out of the mildly tuned XT. When they requested a bike from Yamaha they were turned down and were informed the bike was supposed to be for the American market only. Hallman ended up having to buy a used XT500 off an American rider who had entered one in the 1975 Six Days Trials in England. Armed with their new toy, Hallman and Lundin set about turning the mild mannered XT into a fire breathing racer. 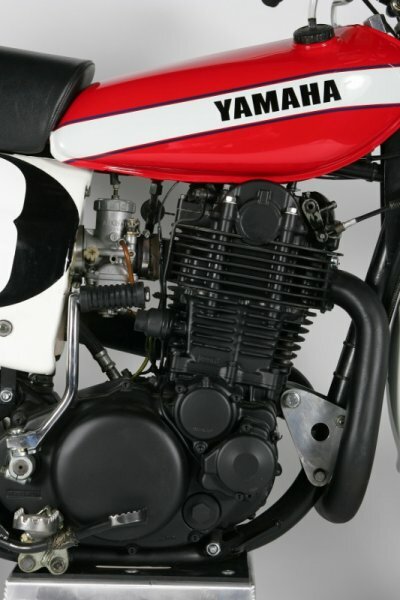 The HL500’s 499cc two valve power plant was based on Yamaha’s XT500 enduro bike motor. Stock, it pumped out a mild 30hp, once modified and tuned for racing, these thumpers could crank out over 50 thundering horses. Hallman and Lundin started the HL500 project by striping the XT completely down and tossing everything but the motor. From there they went looking for a suitable lightweight frame for the bike. They decided on a Swedish Husqvarna motocross frame and modified it to fit the massive Yamaha thumper. Once the Swedish chassis and Yamaha XT motor were mated, a new motorcycle was born, the Hallman-Lundin HL500. In ‘78 and ‘79 Yamaha actually produced a limited run of production HL500s. These were loose replicas of the factory racer and their performance left a lot to be desired. Only around 400 of these rare bikes were ever produced. Once they had a running prototype going, they sent the bike off to a company by the name of ProFab to have the frame’s specifications copied. ProFab then used the modified Husky frame as a template for a frame made specifically for the HL500. 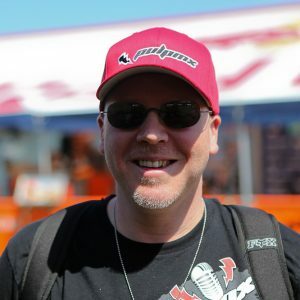 Once Hallman had a few of the bikes up and running he got the wild idea to actually try and race the HL500 in the 500 Motocross GPs. 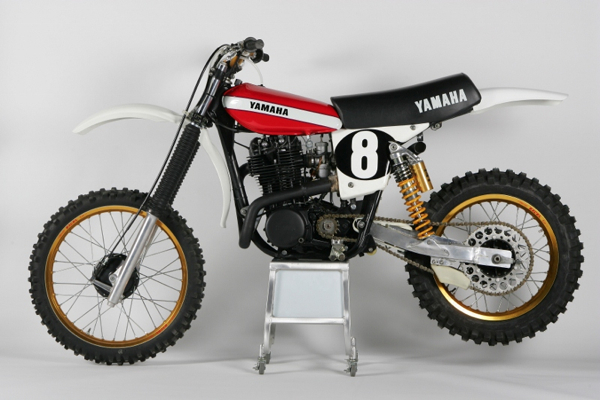 Hallman convinced Yamaha it would be a good PR for the XT to race the bike in the ’77 GP’s and turned to fellow Swede and two-time World Motocross champ Bengt Aberg to campaign the all-new machine. After one ride on the HL500, Aberg was hooked and he committed to race the bike in the 1977 500 GP’s. 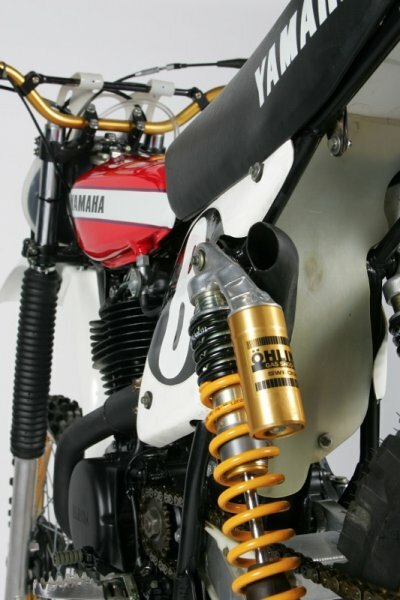 The original HL500 “works” racer featured Fox Air Shocks and a lightweight aluminum swingarm. Since many HL500s were sort of a “do it yourself kit” racers (ProFab would sell you a frame and you would build the rest) all manner of suspension components were used on the bikes over the years. This 1979 model is equipped with a very high dollar set of Swedish Ohlins Shocks. The HL500 made quite a splash in the ’77 500 MX Grand Prix’s. In the bike’s debut Alberg scored the first points for a four-stroke in the GP’s in a decade. At the Luxembourg Grand Prix he actually managed to win a moto on the big four-stroke. By the end of the ’77 season, Alberg and the HL500 had claimed several third place finishes and taken ninth in the overall standings. For Yamaha it was a PR windfall as virtually every enthusiast magazine featured stories on the HL500. It became known as the “Alberg Yamaha” to the general public who were fascinated by the custom machine. 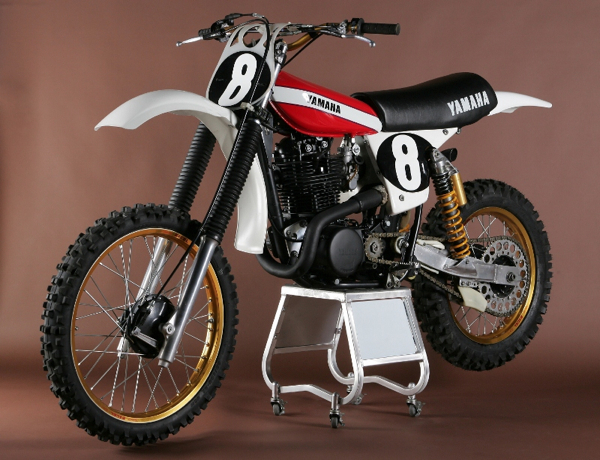 Interest was so high that Yamaha decided to make a limited run of HL500 factory replicas for the 1978 season. 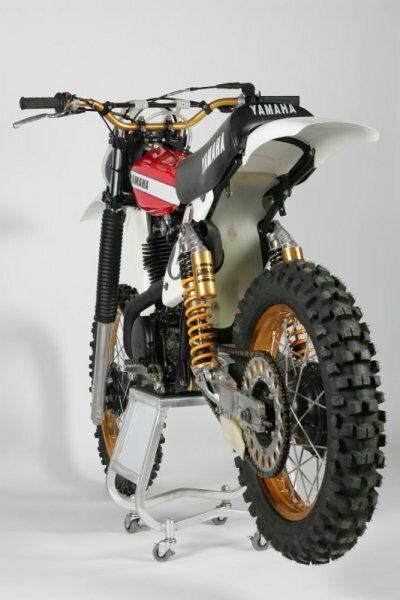 The bike would be produced in Great Britain and it would feature a combination of XT and YZ components. The production HL500 made great use of Yamaha’s parts bin. 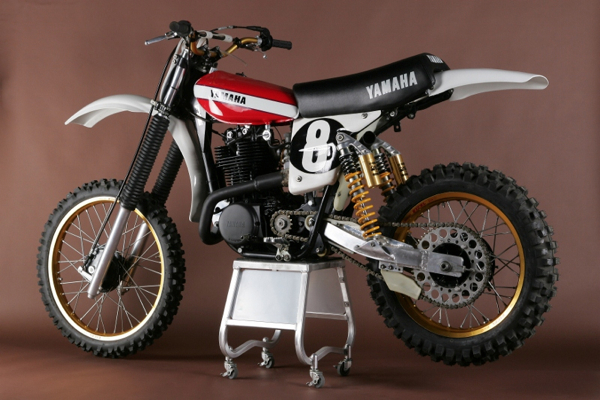 The front forks, wheel and brakes were all off of Yamaha’s existing YZ400 two-stroke racer. The production HL500 tipped the scales close to 260lbs. That was about 30lbs more than Alberg’s factory racer, but still 50lbs less than the XT500 that had inspired it. I have a sneaking feeling this cool side pipe exhaust might have a tough time passing the current FIM sound requirements. In the early eighties Rick Johnson and Ron Lechien both raced ProFab framed HL500’s in the four-stroke Nationals. Yamaha ended up producing 200 HL500 factory replicas in ’78. 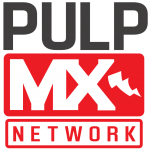 The bikes had slightly modified XT500 motors and YZ spec suspension. The production bike was much heavier and slower than the Factory racer had been, coming in at close to 260lbs and pumping out around 30hp. For ’79 a further run of 200 HL500 were made for the lucky few who could find one to buy. The ’79 is by far the better bike with a modified “drop” swingarm which offer more suspension travel and several motor upgrades to increase power. Either of these bikes is extremely rare today as the complete run only totaled 400 machines. Most of the HL500’s seen today are kit racers, made piecemeal from ProFab frames and TT or XT motors. Yamaha would continue to campaign these highly modified ProFab framed HL500’s (later 600’s) into the early eighties with riders like Rick Johnson and Ron Lechien at the controls. If the YZ400F had a granddaddy this bike would be it. It would take Yamaha twenty years to make another stab at a serious four-stroke racer. The HL500 was a bike way ahead of its time. 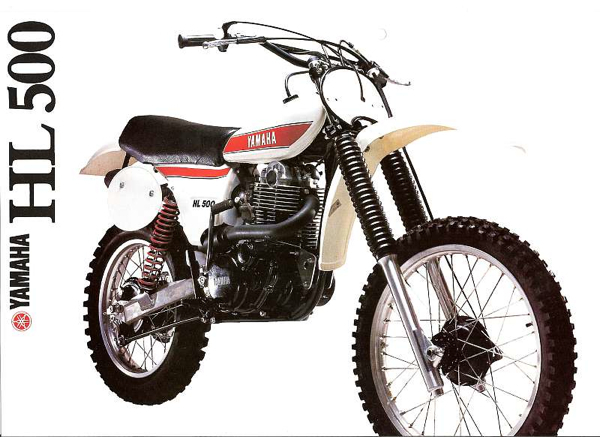 The HL500 was never a huge sales success for Yamaha, but the press it received helped sell a lot of XT and TT off road bikes in the late seventies for the brand. The HL500 is an interesting footnote from an era dominated by two-strokes. 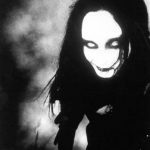 It was an idea about twenty years ahead of its time. In 1997 Yamaha would pick up the torch laid down by the HL500 and lead a four-stroke revolution that would change motocross in the new millennium.